Creativity, a whiff of fresh air ! MoD Vs DoPT : Aye for the forces, Nay for the agencies ! Just the opposite of the life time gag on spies is expected to be implemented for Defence Officers. In a welcome decision, the Ministry of Defence has in principle agreed to do away with permission required to publish material by defence officers in public domain in their personal capacities. Officers may soon be free to express their views in articles and books without seeking prior permission while doing so in personal capacity. Rules permitting the same may be incorporated in the times to come. Contrary to popular perception however, the Armed Forces have not been very stingy even earlier in granting permissions for creative activities by serving defence personnel. Further contrary to what is usually perceived, even serving Army officers, in a limited manner, can indulge in creative activities for commercial gain with prior sanction of the Central Govt. Now compare this with the blanket gag on former employees of civil intelligence agencies issued by the Department of Personnel & Training (DoPT) who would now risk having their pensions at stake in case they publish information which may “prejudicially affect the sovereignty and integrity of India, the security, strategic, scientific, or economic interests of the state, or relations with a foreign state or which would lead to incitement of an offence”. This blogger (personally) does not entirely disagree with the power of the govt to impose a gag in public interest but there must be a good system of checks and balances in place and it should not be left to superior govt officers to decide the already ambiguous terms such as sovereignty and integrity in such a context. Offences and misdemeanours of this kind have to be strictly defined under the system in the rule book so as to prevent misuse by the overzealous. 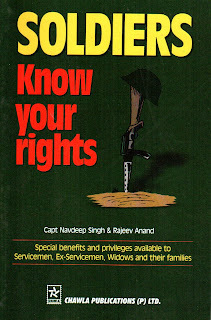 On popular demand, here is a slide show on certain benefits and privileges available under various laws and schemes to defence personnel and veterans.